All OAP services will be delivered in a family-centred approach that promotes the active engagement of parents/caregivers through access to resources and support, informed and transparent decision making and the delivery of flexible and responsive service based on family priorities, strengths and needs. Parents/caregivers will be engaged, oriented, and supported from initial contact throughout their service pathway in the program. Services are planned and captured in each child/youth and family’s OAP Family Service Plan. For children and youth receiving autism, special needs and/or mental health services concurrently, service providers are encouraged to collaborate with a view to promoting a seamless and coordinated service experience for families. Children and youth with ASD vary greatly in terms of their specific skill building needs and the intensity and scope of services required. Within the context of the local service delivery system, different ways of delivering services may be required to best meet the range of needs, including individual and group-based service. Flexibility is required both in terms of the services and supports that are developed and the ways in which they are delivered. This includes offering families with the choice of either receiving evidence based behavioural services through a regional provider or funding to purchase these services from a direct funding provider. Providers are encouraged to build upon existing partnerships, such as information sharing agreements and service pathways to optimize seamless service delivery for families of children/youth with ASD. Respond to the service needs of Francophone children/ youth, and their families, be aware of distinct approaches that may be required to address the needs of First Nations, Métis, Inuit and urban Indigenous children and youth, and provide culturally appropriate services to all families. A key principle of the OAP is child, youth and family-centred services. As per the OAP Clinical Framework, family-centred care is an approach to planning and delivering care that promotes collaborative partnerships between care providers, children and their families. Family-centred service recognizes that each child, youth and family is unique; that the family is the constant in the child/youth’s life; and that the family has expertise in their child/youth’s abilities, interests and needs. All decisions about supports, behavioural services, and the coordination of services are made in partnership with the family and/or youth and their priorities are at the center of those conversations. One component of family-centred service is the development of the OAP Family Service Plan. 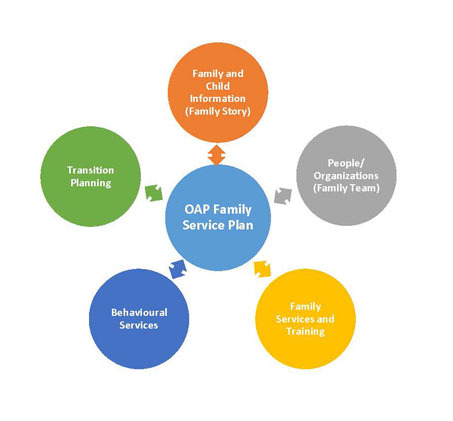 The OAP Family Service Plan is a living document that changes over time to reflect the shifting priorities of the family, the child’s developmental stage, progress toward goals and objectives and transition planning. The OAP Family Service Plan may include the formation of a Family Team, as described in the OAP Clinical Framework. The plan will be initiated by the OAP Family Support Worker, who will support the family through its development, revision and delivery of the components illustrated above. Each child/youth and their family will have an OAP Family Service Plan that will be unique to them. The following sections describe in further detail, the key components of the OAP Family Service Plan. The development of the OAP Family Service Plan and services offered by a Family Support Worker are provided to families through a regional service provider. Family Support Workers will follow the comprehensive information collection process outlined in the OAP Clinical Framework that builds the family story. Families will experience a seamless sharing of family and child information as part of the Family Service Planning process; and the Family Support Worker will review and build on key information, about the child/youth and their family, including relevant assessments and reports such as the Individual Education Plan (IEP). Ongoing involvement of the Family Support Worker will be optional for families. The family story will be updated at a minimum of every six months, or at the progress reviews. Providers may want to explore the use of a common consent form across the service area where possible and in keeping with requirements under applicable privacy laws. They will be required to seek consent for information sharing at the beginning of the Family Service Planning process and at key decision points to minimize the amount of time consent will need to be sought. Inter-professional partnerships and the Family Team are key elements of service delivery in the OAP. OAP service providers will work with their partners to ensure they are planning collaboratively and integrating practice and service delivery for children/youth with ASD and their families. The service planning process will include assisting families in navigating and coordinating services for their child/youth. The OAP Clinical Framework focuses on the importance of this collaborative and interdisciplinary approach to service planning; and outlines how the Family Service Plan will be developed, revised, and maintained with input from all relevant professionals and people in the child/youth’s life. Many children/youth with ASD are active in school, in their communities, with their families and with other services outside of the OAP. They also have natural supports in their life, like friends, community members, caregivers and extended family members. The OAP Family Service Plan will consider the services and supports that those outside of the OAP provide. When working with children/youth in the OAP who are in school, OAP service providers are encouraged to develop, promote and maintain strong partnerships with their local school boards. The OAP Clinical Framework provides further details regarding how the Family Team is formed should parents/caregivers wish to do so, as well as how the Family Team is engaged and updated on a regular basis. In some situations, if a child/youth receiving services from the OAP has multiple and/or complex needs, the OAP Family Support Worker may refer the family to the local Coordinating Agency for Coordinated Service Planning under the Special Needs Strategy. In these situations, the OAP Family Support Worker will remain involved with the family and will participate in Coordinated Service Planning to promote streamlined service delivery and avoid duplication of roles. Learning materials that are written clearly in family-friendly language and when possible translated into a variety of languages based on the needs of the community. These services include information, workshops, groups and seminars specifically aimed at orienting families who are new to service and providing them with introductory and foundational information about ASD, ABA and how services are provided in the OAP. Families who are new to the OAP can expect to be offered foundational parent/caregiver services within six weeks of registration with the OAP. These services are delivered by regional providers and available at any time to families in the OAP. Families will also receive foundational information about the OAP from their Family Support Worker, including the service options available to each child, youth and family. Families will have the option to receive their evidence based behavioural services directly from a regional provider or receive funding to purchase these services from a direct funding provider. This information will be referenced at several points during the development of the OAP Family Service Plan and/or while a family is deciding how they would like to receive their evidence based behavioural service in the OAP. Guidance, information about and navigation of services within and outside of the OAP. Regional providers collaborate and partner with each other and other professionals to offer a robust continuum of family services and training to meet the needs of the families in their region. Sophie's parents identify a need for support with teaching her to independently use the toilet. Their Family Support Worker suggests that they begin by attending a workshop on preparing for toilet training. The workshop covers training methods, child and caregiver readiness, and appropriate data collection methods. A few days after the workshop, the family is provided with a follow-up coaching session to provide additional in-home support. Her parents use the strategies successfully on their own at home and follow up with another coaching session to ask some questions a couple of weeks after the initial coaching session. Evidence based behavioural services, including Applied Behaviour Analysis, in the OAP will be delivered through a strengths based approach that empowers families to develop the skills and knowledge to address needs as they arise. Evidence based behavioural services will be delivered in a manner that emphasizes and prioritizes the development, maintenance and generalization of functional skills, including those skills that prepare children/youth to more fully benefit from inclusion in typical settings. This applies to services delivered by both regional providers and direct funding providers. A variety of evidence based behavioural services will be offered in the OAP. The timing, duration, intensity and scope of behavioural services will be adapted to meet the individual needs of each child/youth and their family. OAP service providers will continue to collaborate with the education sector to support children in building the skills they will need to be ready for school, to participate fully in school and to transition to school as clinically appropriate. Reduce challenging behaviour that interferes with learning and adaptive functioning. An OAP Behaviour Plan is required for every child/youth receiving evidence based behavioural services in the OAP. As described in the OAP Clinical Framework, an OAP Behaviour Plan is a detailed description of the evidence based behavioural services that the child/youth will receive in the OAP. The Plan is based on feedback from the family, and a clear understanding of the family's expectations, capacities and priorities, as well as the clinical recommendations from the OAP Clinical Supervisor. The OAP Behaviour Plan is a key component of the OAP Family Service Plan and is developed through collaboration between the family, the OAP Clinical Supervisor and other professionals (including the Family Team if one has been created for the child or youth) as necessary. Information gathering: The Clinical Supervisor gathers information about the child or youth's strengths and needs from medical, educational and clinical community support documents, and through discussion with the family and other professionals as needed. Assessment: The Clinical Supervisor observes and directly assesses the child or youth to inform behavioural service goals and strategies, and to create a baseline for ongoing observation and assessment. Results are discussed with the family. Clinical Recommendations: The Clinical Supervisor makes a recommendation about how much and what type of behavioural services the child or youth needs. The Clinical Supervisor discusses these recommendations with the family. Preparing the OAP Behaviour Plan: The Clinical Supervisor writes the OAP Behaviour Plan with the involvement of other professionals as needed. The OAP Clinical Supervisor reviews the OAP Behaviour Plan with the family and obtains their informed consent to proceed with the services. Delivery of Behavioural Services: The clinical team delivers services as outlined in the OAP Behaviour Plan. Monitoring and Evaluating the OAP Behaviour Plan: The clinical team monitors and evaluates the OAP Behaviour Plan on an ongoing basis, and provides regular progress updates to the family. The OAP Clinical Supervisor writes a progress summary at least every six months, and discusses it with the family. Revising the OAP Behaviour Plan (if needed): The Clinical Supervisor discusses any proposed significant changes to the OAP Behaviour Plan with the family through an agreed upon form of communication (e.g., written, telephone, meeting). Learning new skills and the generalization and maintenance of those skills will be the focus of all aspects of the OAP Behaviour Plan. To support this, services should be delivered in a variety of settings when possible and in a manner that is flexible, taking into account each family's specific needs. Consultation with other professionals involved with the child/youth. Maintenance of the primary learning environment/educational programming when possible and appropriate. The Family Support Worker will schedule touch points with the family at least every six months, as noted in the OAP Clinical Framework. When a new need or concern arises, the family, the Clinical Supervisor and the Family Support Worker, if applicable, will discuss the appropriate approach to addressing the need and determine whether a new assessment and a new OAP Behaviour Plan is required, and if so, will facilitate the assessment, at the earliest possible time. Example: Aamir and Naseem are 3-year-old twins who have just come in to service with the OAP. Based on their individualized assessments and the priorities identified by their family, an OAP Family Service Plan has been developed for each of them. The Family Service Plans for both boys include opportunities for the family to learn some foundational information and to begin to build their capacity as informed mediators. Both plans include direct teaching, opportunities for generalization and maintenance in their natural environments and training and education for their parents and other caregivers. Aamir and Naseem’s assessments found some differences in their learning styles, strengths and needs and therefore their OAP Behaviour Plans include different goals and approaches to meeting those goals. Aamir was found to need intensive one-to-one Evidence Based Behavioural Services to increase his rate of overall learning and development. Naseem has some age appropriate skills that he has developed through natural learning opportunities at home and childcare and he was found to need Evidence Based Behavoural Services that focus on building his communication and social skills. Times of transition can be especially stressful and challenging for children and youth with ASD and their families. Knowledge regarding information and resources available and advance preparation can help to reduce stress and facilitate a successful transition. A family may request to withdraw from the OAP with or without transition support services. The removal of a diagnosis of ASD would also warrant an individualized transition plan out of the OAP. OAP service providers will offer a range of transition supports and services to meet the complex and varying transition needs of children and youth with ASD that may evolve over time. As per the OAP Clinical Framework, transition planning will be individualized, planned in advance and achieved in partnership with the OAP provider, family and/or youth, educators and other service providers, as applicable. These services and supports can vary depending on the identified needs of each child and/or youth and their family. Transition planning can encompass educational transitions (e.g., into kindergarten, from elementary school to secondary school), personal transitions (e.g., a move of the family home, changes in family makeup), and transition to adult services (e.g., specialized training, self-advocacy, employment and independent living skills). Partnerships and collaborative planning with OAP service providers, families and/or youth, educators and other service providers is instrumental for planning successful transitions to school and maximizing coordination of care and learning. In the first phase of implementation of the OAP, Connections for Students continues to provide coordinated and seamless transitions to school for school-aged children and youth who are in the former AIP program. Transition planning follows the existing Connections for Students model; however, these children/ youth will continue to receive service from the OAP. Continues to be a collaborative model and includes OAP service providers, local school boards and families in the transition model. As the design of the OAP continues to evolve, further communication on the future of Connections for Students will be provided. Until such time, these guidelines should be used in conjunction with Program Guidelines for School Support Program and Addendum: SSP-ASD Consultants' Responsibilities in Connections for Students Multi-Disciplinary Transition Teams. As a family and/or youth plan to transition to adulthood, post-secondary education and/or adult services, successful transition planning is achieved through active partnership and collaboration between the OAP service providers, the family and/or youth, educators, and other service providers, as applicable. Optimal transition planning is directed by the individual needs, strengths and interests and identified goals of the family and/or youth to promote independence, and improve quality of life. Youth with ASD and a developmental disability may be involved with Integrated Transition Planning for Young People with Developmental Disabilities (TAY). This initiative is focused on ensuring that young people with developmental disabilities have a single integrated transition plan to support their transition into adulthood. Upon request, starting at age 14, every young person with a developmental disability can get a written plan that helps him/her prepare for adulthood and the transition from youth-centred services and secondary education, to adult community services in a considered and coordinated manner. Local protocols have been developed and lead agencies identified to lead this process locally, and OAP service providers are encouraged to collaborate in this process as appropriate. All regional providers and/or the Family Support Worker must offer families the choice of receiving evidence based behavioural services through a regional provider or to receive funding to purchase evidence based behavioural services through a direct funding provider. Family Support Workers are responsible for providing families with objective and consistent information about the service options available to them, and acknowledge as part of the child's case file that this information has been provided. Family Support Workers are not responsible for making decisions related to funding or service intensity. Families will receive objective information about their service options at several points during their service pathway, including at registration for the OAP, development of the OAP Family Service Plan, prior to a child or youth's spot for evidence based behavioural service becoming available, and/or at progress assessments. Once the child or youth's spot for evidence based behavioural services becomes available in the OAP or if a child/youth is already receiving behavioural services, at their next progress assessment, the family will be supported in making an informed decision about their service options. Families will continue to be offered this choice at each progress assessment (at least every 6 months). Families can discuss their service options with their Family Support Worker or provider at any time. Regardless of the service option a family chooses, all families will have an OAP Family Service Plan, and will also be offered family services and training through regional providers to provide foundational parent/caregiver services and to promote ongoing generalization and maintenance of skills learned. If a family chooses the direct service option, they will work with their regional provider to identify their child or youth's needs, strengths and goals and begin to develop their OAP Behaviour Plan (See Section 5.2.1). If a family chooses to receive funding, families are responsible for choosing their own provider to best support their child and family's needs. Families can access supports to help them find a provider on the MCYS website. Once a family chooses a direct funding provider, the provider will work in collaboration with the family and OAP Family Team to create an OAP Behaviour Plan based on the needs of the child/youth and family. The direct funding provider will provide families with the budget associated with their OAP Behaviour Plan. Evidence based behavioural services in the OAP will be funded up to a maximum rate of $55/per hour. The maximum hourly rate includes direct hours spent with a child/youth, family member and/or any member of the OAP Family Team. This includes time spent assessing the strengths and needs of a family, where the child/youth and/or family is present. This could also include meetings with members of the OAP Family Team (as identified by the family) to consult and align the approach to services across multiple environments or to support maintenance and generalization at home and in the community. Taxes and indirect services such as report writing, therapist supervision, travel, program supplies and staff orientation cannot be billed separately and instead should be factored into the hourly rate. OAP service providers are expected to charge a lower hourly rate for services which are less resource intensive. Available funding may not cover all of the costs incurred through a private arrangement. Parents are encouraged to ask questions and request information related to service fees in writing to be sure they fully understand the fee structures of the provider they are choosing to work with. This funding may not be used to pay for any other services outside of the OAP Behaviour Plan (e.g. Music Therapy). The OAP Behaviour Plan Budget detailing the evidence based behavioural services that the child or youth and their family will receive and the costs associated with those services. For more information, see the OAP Behaviour Plan Budget. If there are significant changes to the OAP Behaviour Plan (e.g., change in method to achieve a goal, or emerging challenging behaviours), that can still be met within the submitted budget the Clinical Supervisor should prepare an amendment to the OAP Behaviour Plan, showing how services will be delivered. Clinical Supervisors providing services under the OAP's Direct Funding Option must submit this amendment to the single point of access. If the changes in the OAP Behaviour Plan are beyond the scope of the funding included in the budget, a new OAP Behaviour Plan and Budget is required to be submitted to the single point of access. In the OAP, direct funding providers are expected to work in collaboration with all OAP service providers, including the single point of access and other professionals who are involved with the child/youth and family and to align service goals and approaches. Choose their own direct funding provider to best support their child/youth and family's needs. Review and sign the budget associated with their OAP Behaviour Plan to indicate consent to proceed. Enter into a funding agreement with the single point of access to receive direct funding for evidence based behavioural services. Submit receipts to single point of access as per the funding agreement. If families are receiving funding to purchase evidence based behavioural services, or receiving services directly from a regional provider and wish to change their service option, they must notify the Family Support Worker and/or the single point of access. When a family wishes to change their service option, all efforts will be made to maintain service continuity however, it is based on provider availability. The single point of access is responsible for reviewing all required documentation, including the OAP Behaviour Plan, OAP Clinical Supervisor Attestation and OAP Behaviour Plan Budget to confirm completion for the purposes of flowing funds. This is an administrative review and does not include a clinical review of the OAP Behaviour Plan. Within 30 calendar days of receiving the required documentation outlined above, the single point of access will flow funding to the family based on the OAP Behaviour Plan, or advise on any additional documentation required. Budgets will be submitted and funded for up to a maximum of six months. The single point of access is responsible for entering into and providing a funding agreement with the family, which will outline the budget associated with the OAP Behaviour Plan and the reconciliation process. Administrative staff at the single point of access are expected to reconcile all submitted receipts within a maximum of 30 calendar days after the last receipt is submitted for direct funding. If it is determined that funding was spent on ineligible services, steps will be taken to recover the funds from the parent/caregiver who has signed the agreement. All documentation submitted to the single point of access is subject to audit by the Ontario government.